There’s this one thing that frustrates me for, really, no good reason. 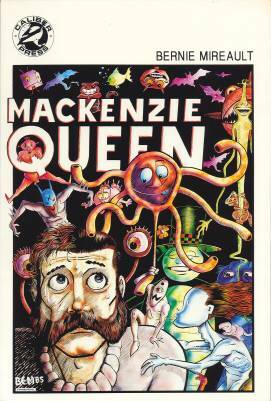 So, many years ago, even before my entry into the high-finance world of comics retailing, I was trying to put together a run of the ’85 indie mini-series MacKenzie Queen by Bernie Mireault. I found the first four easily enough, but the fifth one took some searching. Like, a lot of searching. More searching than I should have expected, given that I began looking for these issues just a couple of years after they were originally released. But then again, this was in the midst of the black and white glut and bust, so it probably shouldn’t surprise me that an obscure b&w title from an even more obscure publisher would have slipped through the cracks. Now here’s the thing that frustrates me. I’m sure a lot of you comic buyers out there have had that one comic you’ve been seeking for ages, and once you find it, suddenly…you can’t stop finding more copies of it. It just seems like it’s everywhere. I mean, it’s not just me, is it? There was an issue of Zot! that was like this for me…I couldn’t find #5 (again, a fifth issue…what’s up with that? ), looked for a year or two, and finally found it. And then, of course, every time I turn around I find more copies of the damned thing. But for whatever reason, that wasn’t nearly as frustrating as the whole MacKenzie Queen thing. 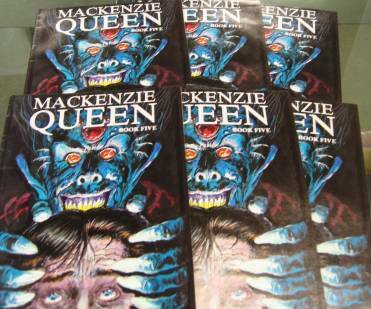 And yes…once I found MacKenzie Queen #5, I started seeing more of them. And every time I would see one, it would remind me about how long I’ve looked for that issue. And let me note that no other issues from this series were in the box. Just #5. The comic collecting gods are mocking me. Told you this is a point of frustration that has no real good reason. Any reasonable human would have been over this by now. By the way, I’ve been looking for an issue of Yummy Fur (#9) for, like, twenty years now. I know as soon as I find that, I’ll suddenly be hip-deep in issue #9s, because the universe is laughing at me. Well, I can verify, for the one or two fellas from the GCD who are kind enough to read my site, that the MacKenzie Queen trade paperback does exist. I bought back when I expected I’d never find the #5…even though I did have the story already, I still bought that #5 when I found it, because, well, you know how comic fans are. Published by Caliber Press in 1990. Still in black and white. Paper smells kind of funny, like most Caliber Press books. If you GCD guys need a larger pic, just let me know where to send it. In other news…well, it’s not a lot of news, but these items have been brought to my attention, and they must be revealed to the public! From the comments, commentator Michael points out [EDIT: Haloscan comment link dead] this collection of graffiti photos that has an image of interest to Swamp Thing fans about nine pics down. Of all the things (har) I never expected to see spray-painted on a wall…. And Johnny Bacardi was kind enough to direct me to a Presidential/Vice Presidential pairing that I can get behind. I’d of course would want the VP candidate in the President slot, and vice versa, but I could live with the ticket as it stands.